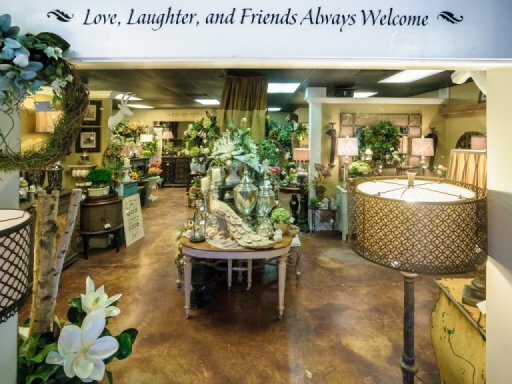 Dayspring Designs is a unique home decor and and gift shop that offers a wide variety of affordable home furnishings and accessories to accent your rooms and provide the finishing touches for your home. We feature unusual pieces with new items arriving weekly. Our decorating services focus primarily on working with people, with what they already own and treasure, by rearranging and adding focal points. We will work with clients to update their look by editing, adding new pieces, and prioritizing future decorating needs. We travel in Texas and out of state working on over 100 short term decorating projects each year in homes, offices ,and churches. Additionally we decorate over 60 homes and offices for Christmas each year. We design and create the fresh flower pieces and decor for over 40 weddings and events each year. We work with our clients to achieve the look they desire. It is a privilege to be a vendor for these events, and our desire is to make it everything our client wants it to be. The shop features beautiful and unique floral designs, and has a constant stream of custom floral pieces created specifically for clients. From Childhood I have loved decorating rooms and setting pretty tables. My mother enjoyed having a comfortable home and it was a challenge to her to be creative and resourceful. We frequently had guests for meals and overnight. If there was just one, or 70 people for dinner, it was done with ease and plenty of good food. I also remember gathering and arranging dozens of fresh flowers grown by my mother. Flowers felt good and special... adding so much color and wonder to life, and they still do. The seeds for Dayspring Designs were definitely planted on that home farm in Nazareth, Texas. Through the encouragement of friends and family who said "you should do this as a business," and people who asked to purchase my items or to help them with decorating~ thus began this business from my home in 1995. In early 2003, we moved into our current location; then expanding the shop and keeping regular hours in March of 2008. It has been one of my greatest joys to see people delighted with their own homes and treasures. Another joy is to create occasions that make people feel special. I have been blessed to have exceptional co-workers with that same desire to serve. We hope stopping by our shop will be a fun and regular outing. We appreciate the opportunity to serve you. We have moved into our new location! Please come visit us soon!